C1621. 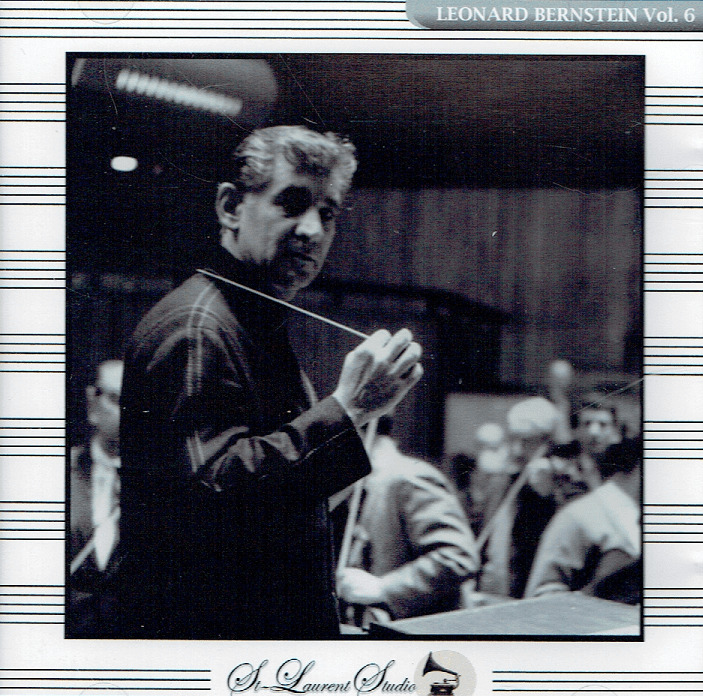 LEONARD BERNSTEIN Cond. NYPO: Symphony #83 in g (Haydn); Study in Sonority (Riegger); Symphony #6 in d (Sibelius). (Canada) St Laurent Studio YSL T-615, Live Performance, 5 May,1967, Philharmonic Hall, New York. Transfers by Yves St Laurent. “In FANFARE 39:2, Huntley Dent entered Leonard Bernstein’s New York Philharmonic recordings of the complete symphonies of Sibelius into the Classical Hall of Fame. He wrote perceptively about Bernstein’s lifelong commitment to Sibelius’ music, and the utter conviction with which he conducted it. The Sixth Symphony is one of the toughest of Sibelius’ seven to lead. It can easily seem like a shapeless series of fragmentary moments. It lacks the long-breathed thematic material and development to be found in varying forms in four of the first five symphonies (#3 is another enigmatic piece). One of the oddities about the Sibelius Sixth is that each movement doesn’t really build to a climax. The music progresses along, and then stops. Bernstein, with a complete mastery of the concept of tension and release, along with an infinite variety of colors and degrees of intensity at his disposal, makes it all seem like a logical progression. The studio recording was made four days after this live performance from 1967, which has even more frisson than that admirable effort. The rhythmic intensity Bernstein builds in the third movement is almost ferocious, and he manages to weave the varying threads of the finale into something with structural unity and a sense of direction. The Philharmonic plays brilliantly for him. Bernstein’s Haydn recordings have always been highly regarded. James H. North summed up Bernstein’s quite remarkable affinity for Haydn in a comprehensive review in FANFARE 33:2, noting that even the eminent Haydn scholar H. C. Robbins Landon was an enthusiastic admirer of Bernstein’s way with this music. As with Sibelius, this live performance of Symphony #83 has just a touch more energy and presence than the studio recordings. Bernstein’s Haydn displays grace, textural clarity (he always reduced the strings), brilliant wind playing, wit, and that hard-to-define quality known as character. This performance treats the music with the same significance and command that conductors usually reserve for Mozart and Beethoven, without weighing the Symphony down. “According to THE NEW YORK TIMES’ critic Donal Henahan, (15 Oct., 1990), Bernstein was ‘one of the most prodigiously talented and successful musicians in American history’. He is quite possibly the conductor whose name is best known to the public in general, especially the American public. His fame derived from his long tenure as the music director of the New York Philharmonic, from his conducting of concerts with most of the world's leading orchestras, and from his music for WEST SIDE STORY, as well as CANDIDE, WONDERFUL TOWN, ON THE TOWN and his own MASS. Bernstein was also the first conductor to give numerous television lectures on classical music, starting in 1954 and continuing until his death. In addition, he was a skilled pianist, often conducting piano concertos from the keyboard. In 1960 Bernstein and the New York Philharmonic held a Mahler Festival to mark the centenary of the composer's birth. 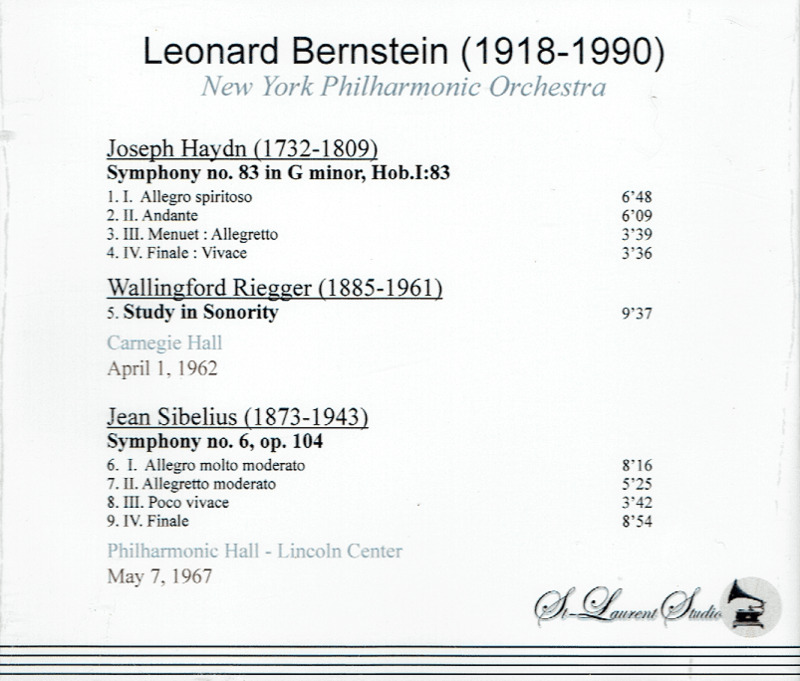 Bernstein, Walter and Mitropoulos conducted performances. The composer's widow, Alma, attended some of Bernstein's rehearsals. 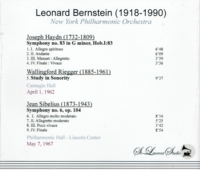 The success of [Bernstein’s Mahler] recordings, along with Bernstein's concert performances and television talks, was an important part of the revival of interest in Mahler in the 1960s, especially in the US. In 1964 Bernstein conducted Franco Zeffirelli's production of Verdi's FALSTAFF at the Metropolitan Opera in New York. In 1966 he made his début at the Vienna State Opera conducting Luchino Visconti's production of the same opera with Dietrich Fischer-Dieskau as Falstaff. He returned to the State Opera in 1968 for a production of DER ROSENKAVALIER and in 1970 for Otto Schenk's production of Beethoven's FIDELIO. Sixteen years later, at the State Opera, Bernstein conducted his sequel to TROUBLE IN TAHITI, A QUIET PLACE, with the ORF orchestra."